The Gunners produced a late salvo to advance. Wenger admits he was worried when his side went 2-0 down. 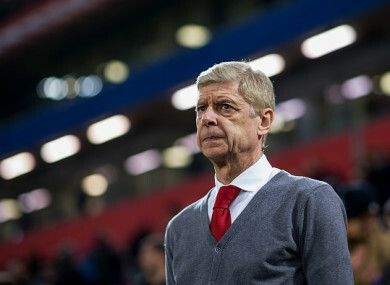 ARSENE WENGER ADMITTED Arsenal were “on the ropes” against CSKA Moscow before a late salvo secured a 2-2 draw in Thursday’s second leg and a 6-3 aggregate win in the Europa League quarter-final. The Gunners took a 4-1 first-leg lead to Russia but found themselves 2-0 down and on the back foot early in the second half, with Fedor Chalov and Kirill Nababkin taking CSKA to within one goal of going through. Wenger had switched to a five-man defence at the break but his side were consistently under pressure, until Danny Welbeck struck a fine goal 15 minutes from time to kill the home side’s momentum. Aaron Ramsey levelled the second-leg scoreline in injury time to spare the Gunners’ blushes further, but Wenger accepted the tie could have run away from his side. “Maybe we were a bit surprised by the intensity of the game and were not at the races, in the first half especially,” he told BT Sport. “They scored the second and Ignashevich had a chance to score goal three, then we were a bit on the ropes. But we had a good response: we were better organised in the second half than in the first, our distances were too big. “If you look at the game, we were in trouble in the first half. Once we moved to a five [at the back], we were more stable and didn’t give so many chances away. The second goal comes from a long-distance shot but, in the box, we didn’t give anything away any more. Laurent Koscielny thinks Arsenal need to have more confidence in their play as they aim to win the trophy and book a place in next season’s Champions League. “No, it was not the plan [to sit back],” he said. “I think we missed a bit of movement to be available for our team-mates, we didn’t win the duels, so it was hard. “They played well with the ball and they had some opportunities and scored two goals. After, we had some pressure on us because, if they’d scored the third, we’re out. Arsenal go into Friday’s draw for the semi-finals along with Atletico Madrid, Marseille and Red Bull Salzburg, who overcame Lazio 6-5 on aggregate after a thrilling 4-1 second-leg win. It is Diego Simeone’s Atletico, though, who Wenger would prefer to avoid in his side’s first last-four tie in Europe since 2009. “It should be every year and it’s never enough, but you could see again this week in Europe that we had a lot of turnarounds and you have to be completely focused in every single game,” Wenger said when asked if Arsenal had disappointed by not reaching this stage more often. Email “'We were not at the races': Wenger admits Arsenal were on the ropes against CSKA”. Feedback on “'We were not at the races': Wenger admits Arsenal were on the ropes against CSKA”.